The Days of Awe approach for Rosh Hashana 5779, and as is the custom, many media site have posted exciting recipes for the Jewish New Year. As is our custom, we begin with the lodestar – the Queen – of Jewish Recipes: Joan Nathan. Priya Krishna writing in The New York Times refers to Ms. Nathan. In Matzo Balls and Chiles? It’s Rosh Hashana With the Flavors of Mexico chef Fany Gerson’s combined the holidays and her heritage in Mexico City. Chef Gerson operates La Newyorkina and Dough (a doughnut business) in New York City. Fany Gerson’s Ukranian Jewish grandparents in Mexico City laced the challot with Mexican cinnamon and tart apples, and filled their matzo balls and gefilte fish with herbs and onions, and guajillo pepper sauce, respectively. People pant for her cherry chipotle rugelach. She will host a big Rosh Hashana dinner at Casa Pública in Williamsburg, Brooklyn, where her husband, Daniel Ortiz de Montellano, is an owner. Honey Ice Cream with ground red chiles, puffed amaranth, pequín, and mango. Did I mention the word lodestar? 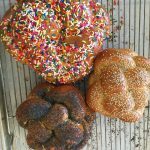 The JACKSON HOLE WYOMING NEWS AND GUIDE shares a round challah recipe with some information on religious services in the area. 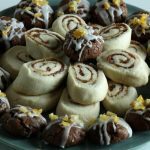 The Chicago Tribune published a story by Peggy Wolf, titled Savoring Old World cookies rich with nuts and dates for Rosh Hashana. She includes a recipe for Sfratti, from Pitigliano, Italy, which are symbolic of the sticks that messengers in the 17th century used to beat on the doors of Jews to order them to leave the town. YIKES. What a lovely New Year memory. and in the FORWARD SHira Feder shares recipes with a modern twist for its registered readers. The Montreal Gazette has no recipes, nor does Toronto’s Globe and Mail. But CANADIAN JEWISH NEWS features Brisket 101 in time for Rosh Hashanah. Vered Guttman for Haaretz features a recipe of “Apple and Honey Cake for Rosh Hashanah” Guttman shares that eating honey or sweet food on Rosh Hashanah is first mentioned in the book of Nehemiah. Meanwhile, red apples were first eaten on the holiday by the Jews of France, as mentioned in the 1208 Machzor Vitri. By the 14th century, the traditions of honey and apples combined. Rabbi Jacob Ben Asher writes in his book Orach Chayim, Manner of Life, that in Ashkenaz, Jews served “sweet apple in honey.” This lovely tradition is kept to this day, although some Sephardi communities avoid honey during the holiday and use sugar instead, perhaps for reasons of kashrut. 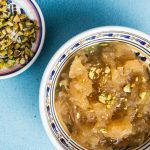 Iraqi Jews, for example, serve apple jam that’s made with sugar. The Jewish Chronicle in London features their best recipe for a honey cake. Or so they say. Or so Zelda Leon thinks, maybe. Julia Turshan, a Goop Paltrow collaborator, colluded with PARADE MAGAZINE – that Sunday supplement in North American newspapers on a roast chicken with leftovers. Next Story → I am the Tsaddik of Our Generation — Deal With It People!! !